organise the basics such as hotels and route, on the feeble premise that if I could (usually) lead a group successfully in the Surrey lanes, then France would be more of the same, provided we remembered to ride on the right. We were again indebted to the wonderful support provided by Ian Young, who transported our bags from hotel to hotel, and was also on hand to provide practical support when needed, such as when John suffered an explosive front wheel blow out, both inner and outer, on a fast descent; a new tyre was soon supplied. 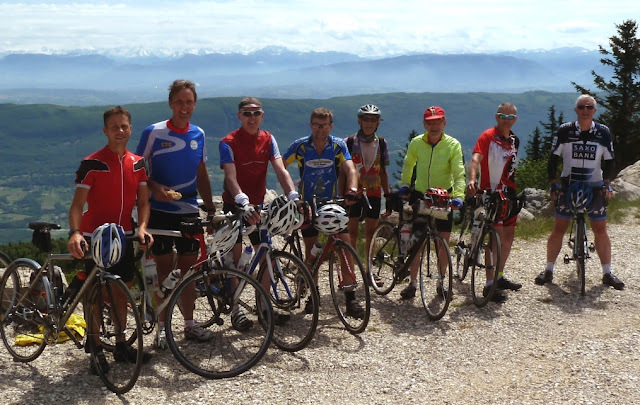 We took in climbs such as the Col du Granier, Mont Revard, Col de la Forclaz, Col du Semnoz, and Grand Colombier, and records showed that in 7 days we climbed over 42,000ft. One highlight was certainly when we were having a look at the route for this year’s L’Etape, which Don will be riding, and on the descent of Mont Revard we noticed the Sky team cars, followed soon after by the entire Tour de France Sky team who were clearly recceing this key stage. We stopped at the next village to refuel (this descending can be so tough), and saw the team also taking a break (albeit not gorging on the cakes, as we were), so we were able to have a quick word with Chris Froome and others; we neglected to pass on any tips, but hope that Chris still manages to win the Tour. The final section of the entire tour ended with an epic 10 mile descent back into Nantua, all top gear and line astern; very similar to the Sky team, just that even downhill we were probably averaging 10 mph less than them when on a flat team trial.